HOW SWEET IT IS – the San Francisco Bay Guardian in its 34th Annual Best of the Bay 2008 issue, voted Beyond Chron BEST LOCAL WEBSITE! Founder/Publisher RANDY SHAW and Editor PAUL HOGARTH are to be congratulated! And the Beyond Chron Team! This writer proud to be a player since October 2007! My attention was drawn to Randy Shaw’s July 28 piece “State Approves Uptown Tenderloin Historic District” that included a picture of the memorable “BLACKHAWK” Jazz Club once located in the Tenderloin at Turk and Hyde; now a vacant lot where homeless or others congregate on the sidewalk, some with their personal belongings. Owners JOHN AND HELEN NOGA closed the club in mid-60’s. Not sure the reason, but before closure Helen took up the pursuit of managing then 19-year old JOHNNY MATHIS. As fate would have it, Mathis was invited to the club by a fellow S.F. State student whose sextet was working at the Blackhawk, brought Johnny in for a Sunday afternoon Jam session. Stunned when she heard the phenomenal singer, Helen decided she wanted to manage his career, signed him to a contract. His first album, self-titled “Johnny Mathis: A New Sound in Popular Song” on Columbia Records was a hit! So you would have to say Mathis career, now celebrating over 50 years in showbiz, kicked off from that meeting at the Blackhawk! I don’t know what became of the Nogas, but The Blackhawk live in the memories of myself and other Jazz enthusiast who frequented the spot during the 50s and early 60s; sadden when the club shut down! 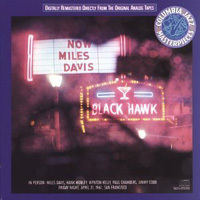 The Blackhawk was my first introduction to LIVE JAZZ! Introduced to greats like MILES DAVIS, JIMMY SMITH, ART TATUM who played his last gig there days before he died. Remember the rudeness of both Miles and Jimmy – non-communicative to the audience but tolerated (years later friends with Smith and his lovely wife Lola; both now deceased). AHHH, recall the QUEEN – DINAH WASHINGTON dragging her luxurious white fur coat behind her as she exited the club through a side door in completion of a torch song. AND H. WARREN (recently moved to L.A.) co-owner popular SUGAR HILL Nightclub when on Broadway across from the JAZZ WORKSHOP, and The legendary HALFNOTE Club (now Independent Nightclub) on Divisadero which closed in late 60s, shared at the encouragement of Cannonball Adderley who was appearing at the Workshop, suggested he check out vocalist CARMEN McCRAE who was headlining at the Blackhawk, stating he might be interested in booking her at Sugar Hill. Thrilled over her performance booked her, and later at the Halfnote. They enjoyed a close friendship that lasted until her death. BEFORE gentrification of the area, the Tenderloin flourished with entertainment – nightclubs like the After Hours spot, “STREETS OF PARIS” (made that scene once or twice). Will CONTINUE with more thoughts in a later column. MAKING THE ROUNDS – SUNDAY evening at the popular DOGPATCH Saloon, at 22nd and Third Street, where COOL ‘N’ HANDSOME noted drummer VINCE LATEANO (tempted to run my hands through his beautiful white hair!) lead the HOUSE BAND – rhythm section include AL MOLINA on horn, with SPECIAL GUEST ANDREW SPEIGHT on sax – NIIICE!!! When he’s in the spotlight, a whole different sound hits you!!! Remind me of STAN GETZ! DOGPATCH is THE happening spot on Sunday evenings! Entertainers stop in to jam – LADY MEMPHIS wooed us with her moving, smokey flavored “Kinda’ Blue” (Miles Davis hit). Dogpatch’s congenial cocktail waitress JANIS KAEMPFE was STILL reeling over the Saturday Yerba Buena Concert (SEE BELOW); Doorman Brother JIM YARBOUGH (YARBROUGH) collect the $5-donation…he and his lovely wife Sue left this week on a 2-week Alaskan Cruise. SATURDAY afternoon basked in the warm sun on the grounds of Yerba Buena Gardens, spiritually enlightened by AFROSOLO’s JAZZ Concert kicking off 15th Annual Afro Solo Arts Festival, an annual celebration of the African-American experience! The FREE outdoor concert embraced the theme “SaxoPhoNia in Praise of the Saxophone and Jazz innovators” featured three horn players of distinction – RICHARD HOWELL, 15 year-old RAZEL MERRITT and ROBIN NZINGAH SMITH. Regrettably missed the phenomenal young jazz musicians lead by Merritt (member of The OAKTOWN jazz Workshops) who received high praise among those attending the concert – from one JANIS KAEMPFE of Dogpatch Saloon. The spiritual-musical flow of the women jazz group led by saxophonist ROBIN NZINGAH SMITH – THE LADY COULD BLOW! The set included violinist SANDI POINDEXTER (remember John Handy and Class? ); the gorgeous afternoon ended with multi-instrumentalist, vocals, Richard Howell – BAAD BAD – blow you away with Coltrane sound! The terrific group included Fred Harris on piano…Paul on bass, and drummer E. W. Wainwright. Longtime acquaintance with THOMAS R. SIMPSON, Artistic Director/Founder AfroSolo Theatre Company (S.F.) who has worked hard through the years creatively, and a burning passion to keep the arts flowing in Afro music, art, dance and health issues like HIV Aids and health awareness in the African American Community. AFRO Calendar note – MONDAY evening, August 18, at Yoshi’s San Francisco a Gala Concert and Awards in Honor of Four Great Ones: John Coltrane, Sammy Davis, Jr., Duke Ellington, AND HOPE FOYE, 86-year old acclaimed Soprano will receive AfroSolo Distinguished Lifetime Artistic Achievement Award. Balladeer NOAH GRIFFIN (The modern day Frank Sinatra) will perform a tribute to Davis, Jr.; OHNEDARUTH (OH, MY GAWD!!! fluid musicians will BLOW the ceiling off Yoshi’s) of Saint John Coltrane Church located in DA MO on Fillmore near Eddy, will perform a tribute to ‘Trane; and highly acclaimed folk singer ROBERT SIMS, one of this year’s generation spiritual specialists, perform a tribute to Ellington entitled “The Sacred Music of Duke Ellington”. For more INFO call:(415) 771-2376. GOOD COMMUNITY NEWS – DR. JAMES CALLOWAY, former San Francisco School Board Candidate, recently elected President Bayview Hunters Point LIONS Club. Installed August 1 at The Lion’s Annual Dinner and Installation of officers at Patio Espanol. HEY, THERE’S A PARTY OVER HERE … THURSDAY NIGHT – RANDY’S on Ocean Avenue … owner SUE CASTLE, patrons, friends celebrated MR. CARL BROWN’S ??? Birthday. The retired City employee was ready to hang out BUT due to a family emergency could not attend. The party was set – a delicious POT LUCK Buffet served … Miss LATANYA (EARBY) put her FOOT in the Chicken and Dumplings – GIRL, the pot was SCREAMIN’!!! Mixologist JEANIE “P’s” fried chicken and ‘tator salad was OFF DA HOOK!!! … BLACK LARRY’s (COLLINS) deviled eggs — oh so good!!! Birthday cake put on hold … HEARD the following day CARL blew out all the candles in one SWOOP!!! IN CLOSING want to acknowledge the PASSING of a gentleman I often wrote about, FRED SEWELL, longtime San Francisco resident and retired MUNI Operator of 25 years who left us July 22 in Fairfield, CA. My condolence to his family. Son Steven played Pro football. Pop was so proud when he shared the good news. Sewell, one time neighbor, was such a charismatic gentleman who loved being in the mix with his posse fellow MUNI operators, JAMES HERMAN also retired, was one. When doing promotions for popular CLUB PARK VISTA, on Stanyan Street across from KEZAR, now history, honored SEWELL, JOE JONES and Herman, in what was MUNI Night! Sewell was one the ORIGINAL member of The Clubs of the 50’s who for over 25 years, annually celebrate in party fashion in August. I’m sure BROTHER SEWELL will be remembered!